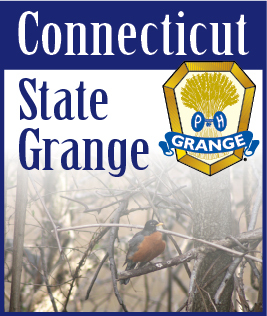 The 132nd Annual Session of the Connecticut State Grange is in the history books. Thank you to everyone who made it successful. At the opening session we had 43 community Granges and 7 Pomona Granges answer the roll call. Our National Representatives, Joe & Tammy Fryman of Blair, Nebraska, were welcomed and informative to all our members and we enjoyed our fellowship with them. I thank Brother Phil and Sister Maureen Prelli for entertaining the Frymans while here in Connecticut. We had 23 resolutions presented and ended with 35 total resolutions at the end of the Session. From my chair, I noticed many new faces in the audience as delegates of our Community Granges. It is great to see these new faces but I did miss the fellowship of those who did not attend. New delegates need mentors to help them understand the working of a State Session, and it might have helped them if past officers were there to assist them if they had questions during the deliberations of resolutions. I thank our Grangers for allowing me a second term as your State Master. Marcia and I are honored to represent Connecticut at the National level. And I wish to thank Sister Eileen Hebert and her installing team from Rhode Island, for a beautiful installation. The Sixth Degree was conferred on 17 candidates and I wish to thank all that help prepare and perform in this lovely degree. Although the night’s weather was more for the Fifth Degree with its thunder and lightning, I just wish more people were there to see it. I congratulate all Granges and Grange members that have received awards at State Session. Your hard work and dedication to the Grange was honored by these awards, let’s keep up the good work. During this year’s election, a first was achieved. Sister Jaimie Cameron was elected to Gatekeeper, the first female Gatekeeper in Connecticut. Congratulations, Jaimie, you are on your way to become the first female State Master in Connecticut. The resolution regarding Pomona Granges has been passed and the Executive Committee is already taking steps to meet the requirements for redistricting new Pomona Granges in Connecticut. If anyone has any ideas, please submit them to Board Members so we can review them. Any assistance is appreciated. This will be reported at the 2017 State Session. Attendance at State Session was normal but the banquet numbers were down compared to the amount the State Grange had to pay for empty seats. Any thoughts can be forwarded as to how to attract more members to attend the session and banquet will be appreciated. The entertainment was great and the Past Deputy Raffle was very good this year with $1,400 raised. I thank the CWA for their hard work in decorating the tables and I thank the General Deputy and his Deputies and Grange members for taking down the Session decorations so the tables for the banquet could be set up. This New Year we are looking for new things to come from the State Grange and we also will be providing more material that National Grange send to the State Master, so everyone can have access to newsletters and information that the National Grange sends out for downloading by Granges. Also, November is the time that we are known for our Charity, with donations to food banks, giving families Thanksgiving packages. Let us all do our part in feeding the hungry and the helpless, as stated in our ritual. Also take time to work your craft fairs and shop at other’s fairs for new ideas or new items, for family and friends. In two weeks we will have a National election and in three weeks the National Grange starts the celebration of 150 years of service. Let us use this time to promote our own Granges and be the Community place to go and get things done. I wish all your families a Happy Thanksgiving.